The word mayonnaise may have originated as moyeunaise – which itself is derived from a very old French word moyeu, which means egg yolk. The term describes a thick sauce of egg yolk beaten with edible vegetable oil, water and vinegar to produce a smooth, white, creamy, sometimes almost solid, liquid. To add different flavours, oils can be used along with regional flavour preferences ranging from different mustards, garlics and peppers to the type of natural acidic preservatives used. The product is popular as an accompaniment to many foods such as Fries, Pizza and salads adding succulence and creaminess. 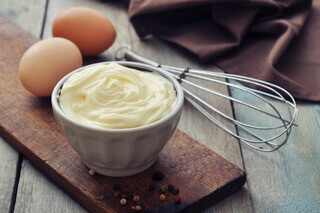 Traditional mayonnaise has 80% oil but many technologies are available from very low fat, to clean label or egg free variants depending on your target. Whether it is to be used as a covering for vegetables in Coleslaw, a base for other products or as a moisture barrier for sandwiches – KaTech have the experience to deliver your needs.